A small bog shrub, 1 to 3 feet high, simple or with a few branches. 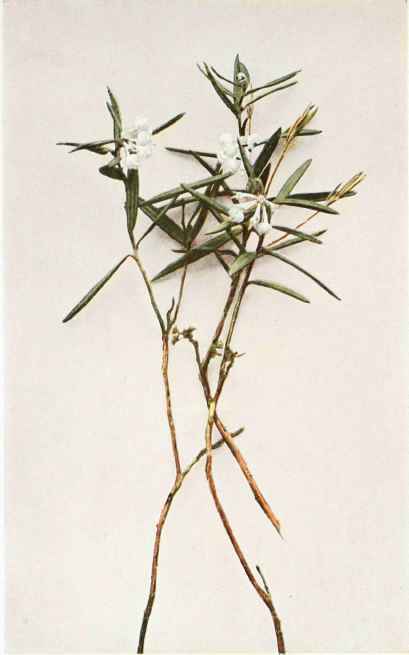 Leaves linear to oblong-lanceolate, pointed or blunt at the apex, narrowed at the base, the margins strongly revolute, dark green above, whitish beneath, 1 to 21/2 inches long, one-sixth to one-third of an inch wide, on very short petioles. Flowers white, drooping, few or several in terminal umbels, the pedicels or flower stalks one-third to one-half of an inch long. Corolla almost globular, one-sixth to one-fourth of an inch in diameter, much constricted at the throat, with five small, recurved teeth, the ten stamens not projecting from the flower. Fruit capsules about one-sixth of an inch in diameter. In sphagnum bogs, Labrador to Alaska, south to New Jersey, Pennsylvania, Michigan and British Columbia. Also in northern Europe and Asia. Flowering in May and June.